As previously rumored, Apple is replacing the default Google Maps service within its iOS operating system with its own mapping solution, according to the Wall Street Journal. Later this year, Apple is planning to oust Google Maps as the preloaded, default maps app from the iPhone and iPad and release a new mapping app that runs Apple's own technology, according to current and former Apple employees. Apple could preview the new software, which will be part of its next mobile-operating system, as soon as next week at its annual developer conference in San Francisco, one person familiar with the plans says. Apple plans to encourage app developers to embed its maps inside their applications like social-networking and search services. Both 9to5Mac and All Things Digital had previously reported that Apple will be using an in-house mapping service in iOS 6 following its purchase of a number of mapping companies, including 3D mapping firm C3 Technologies last year. Apple has clearly been working for some time to reduce its reliance on Google by developing its own mapping services for iOS, as evidenced by its acquisitions of mapping expertise and job postings addressing its ambitions for mapping. The company has already moved location services in-house and revealed last year that it is building a crowd-sourced traffic database based on users' GPS data. Earlier this year it was noted that Apple wasn't using Google Maps in its iPhoto for iOS application, instead using OpenStreetMap and other services to generate map tiles. If true, I hope it works well because I don't think it's too good looking. I truly hope they retain a normal satellite view and PLEASE keep Street View somehow. It is incredibly useful and the whole "3D" gimmick that has been rumored for some time now seems pretty useless. I hope my pessimism is wrong. As long as it includes turn by turn directions I'll be happy! I hope to be blown away by iOS6 because so far the rumors don't sound all that inciting. Honestly, at this point I'm more excited about the new MacBook pros than an iOS maps refresh. They don't want to rely on Google's services anymore. It's not just so they can say they are better. 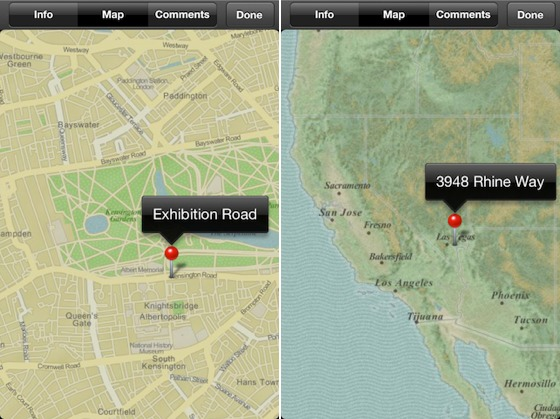 That's the "old fashioned" theme for iPhoto, the real maps app won't look like that. If this finally means turn by turn navigation natively in ios6 I'm all for it. I hope Apple drops Google Maps so that hopefully Google will release their own iOS app with all the bells and whistles that their Android one has.